Checking out of Ensenda on 3/2/15 was easy and we were assisted by Enrique from Cruiseport. He knows his way around the various offices including health department, immigration, customs and the Port Captain. Normally a 2-4 hour event, Enrique got it all handled in about an hour. We said our goodbyes to friends and headed north for our 2015 cruising season. It was hard to leave the Ensenada cruising community but the desire to see more of the west coast and get to the PNW won out. We cleared into the US Customs dock in San Diego after a very calm cruise north. 9 HOURS AND 65 MILES-35 GALLONS. Very courteous customs inspectors arrived and were pleased we have a customs decal which we purchase annually for the same price as a single border crossing. It will also aid us as we move from Canada back into the US later on this trip. We stayed 3 nights at the San Diego Police dock, visited with several friends in San Diego and made the required trips to Costco, Trader Joe’s, West Marine, Marine Exchange and Sprouts. It was fun to have the traditional choices but the prices! Cruising in Mexico spoils you on food costs and labor costs. Next step in the trip was a short hop to Mission Bay. 3 HOURS AND 18 MILES-7.5 GALLONS. We finally feel like we are really cruising. No cars, no plans to return anywhere and only one scheduled event, making it to San Francisco in time to catch a plane to Kentucky on March 23rd. The Navy has a strong presence in San Diego and we were followed out the harbor by this boat. Makes our paint job seem kinda dull! We left Mission Bay on 3/8/2015 headed to Dana Point 6 HOURS AND 46 MILES-26 GALLONS. A visit to the Nordhavn offices for a few parts and another attempt to get a carpet issue resolved. Jeddy, the carpet supplier has been outstanding in supporting us but we have had a difficult time getting schedules to work. This trip was no different and we will try again to resolve the issues in October when we anticipate heading south again. The guest dock at Dan Point West Yacht Club was easy to access and the prime rib dinner was outstanding. 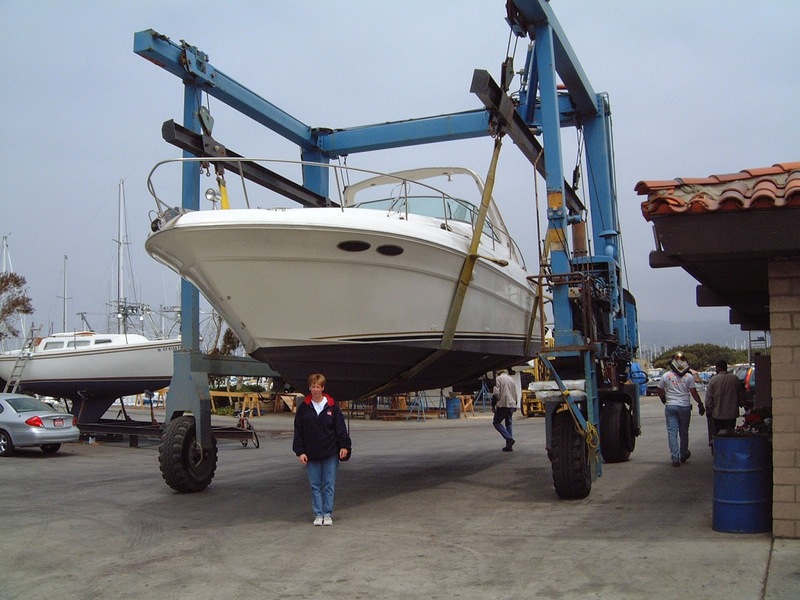 Use of the guest dock and club rights come from our membership in the Point Loma Yacht Club in San Diego. It’s been years since we were members of a yacht club and Point Loma was a good choice for us, easy going and low key. 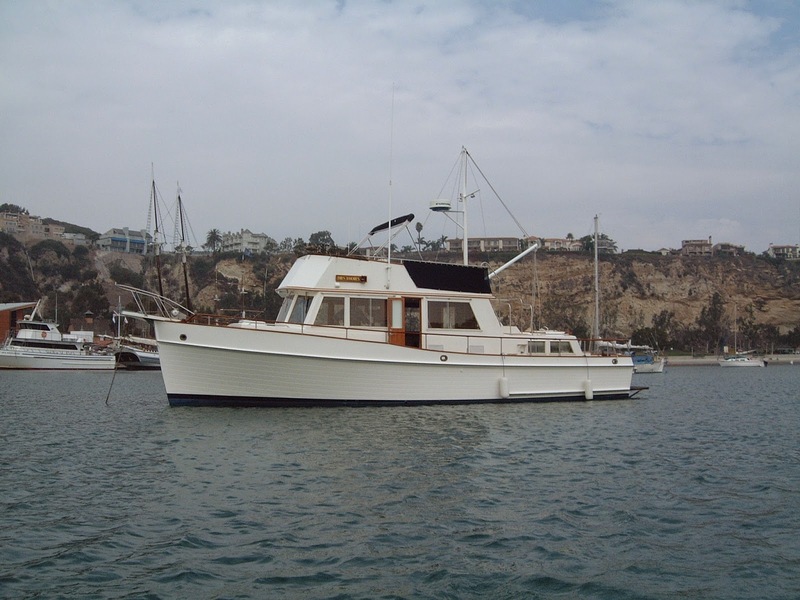 We left Dana Point driven as usual by the weather conditions on 3/11/2015 headed for Channel Islands. 14 HOURS AND 97 MILES- 58 GALLONS. Along the way we discovered we could not fit in the guest slips at any of the Channel Islands Yacht Clubs that were available and opted to keep going to Ventura Yacht Club a little further up the coast. In 2002 this is where Mary and I started our blue water boating experience. We had a 34' Searay Sundancer shipped from Alabama to Ventura Boatyard. More green than brave we quickly traded the fast Searay for 42' Grand Banks much better suited to the rugged west coast. Just before we moved from Arizona to California we had a go-fast capable of 85MPH! We thought the Searay was a turtle. The forecast all the way to Point Conception is outstanding and we did not want to let it go to waste. Even the next leg around the infamous Point Conception looks promising and we will keep moving north while the weather is good. Cruising can be exhausting for some, Keela napping on someone (me).